As the Government considers a £10 daily charge for foreign lorries entering UK roads, motor industry specialist, Accident Exchange, estimates the annual cost of foreign lorry accidents in the UK is already as much as £57,000,000[i]. The figure dwarfs the £23m yearly revenue projected for 2016 by the proposed charges for foreign trucks[ii] and Accident Exchange says the cost of accidents is on the rise. With 44% of innocent party vehicles classified as insurance 'write-offs' and average repair bills exceeding £2,300[iv], the total vehicle damage, combined with average values of prevention - for example the financial impact on the emergency services - is estimated at almost £57,000,000 each year. 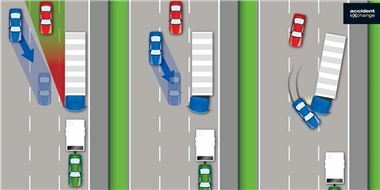 Half (49%) of all the foreign lorry incidents handled by Accident Exchange happened on a motorway. Users of the M25 are most at risk - the London Orbital's 117-mile stretch saw more than one in three (37.3%) of all motorway incidents involving foreign lorries. Despite being almost twice the length at 194-miles, the M1 accounted for just one in six (17.3%) foreign lorry scrapes. The M6 was third with 14.6%. The 50.6-mile M20 in Kent, which connects the M25 to the Channel Tunnel and ports in Dover and Folkestone, experienced 4.6% of collisions. This is largely the fault of car drivers too stupid to realise that the driver of the HGV they are hovering beside cannot see them. All car drivers are urged to pass HGVs as quickly as possible, give HGVs as wide a berth as possibe, and be prepared for them to pull out to pass another HGV. Steve Evans, Chief Executive of Accident Exchange commented; "We're disappointed to see incidents involving foreign lorries on the rise again, despite an excellent DfT-backed Fresnel lens programme to reduce the threat of side-swiping. Foreign-registered HGVs remain one of the most difficult 'at-fault' parties to recover costs from. Issues motorists face include invalid insurance policies; untraceable owners; drivers leaving false details or just failing to pull over at all." In only 72% of the cases analysed were costs recovered from the negligent foreign party. Evans continued: "The proposed charge of £10 daily, or £1000 annually, might redress some of the financial impact caused from foreign lorry collisions, but we're not sure it will solve the root problem of left-hand HGV drivers just not being aware of vehicles around them." Since 2007, in an effort to reduce the problem, the Department for Transport (initiated by former Transport Minister Stephen Ladyman) has handed out thousands of Fresnel lenses to help reduce blindspotsd of left-hand drive HGVs. [vi] More recently Transport for London distributed more than 20,000 of the lenses to freight companies operating in London to improve cycle safety. Under the Road Safety Act, revised in 2010, VOSA officers and police have the power to issue fixed penalties or on-the-spot fines of up to £900 to drivers of foreign vehicles if they commit offences. of motorway casualties - where the majority of foreign-registered HGV incidents occur - the values of prevention are 23% greater. [i] There are an estimated 2.5million cases of vehicle damage reported on UK roads each year - an industry accepted figure. Accident Exchange found foreign lorries were responsible for 3.2% of motorway incidents the company handled in 2011: 3.2% of 107,500 is 3,440 incidents. In the cases Accident Exchange dealt with, 44% of vehicles were classified as insurance write-offs at an average cost of £3,512. Vehicles that were repaired (56%) incurred an average bill of £2,368. The total cost of vehicle damage for 3,440 incidents - repairs and write-offs - is estimated at £9,877,478. Foreign lorry collisions on motorways account for 49% of the total incidents Accident Exchange handles that involve foreign lorries. The rest occur on other road types. The total vehicle damage cost of all foreign lorry incidents, on all road types, is estimated at £20,158,118. Total annual cost to UK economy for vehicle damage and casualties involving foreign lorries is £56,979,298. [iii] There are an estimated 2.5million cases of vehicle damage reported on UK roads each year - an industry accepted figure. [iv] Almost one in two (44%) innocent party vehicles involved in collisions with foreign lorries were classified as insurance 'write-offs', at an average cost of £3,512. Repaired vehicles incurred an average body shop bill of £2,368. [v] Despite foreign lorries being responsible for 3.2% of motorway incidents handled by Accident Exchange, they were only involved in 0.3% of vehicle damage on all road types. This suggests the blind spots of left-hand drive HGVs, most problematic in multi-lane driving such as on motorways, is the biggest contributor to collisions.